All SEOs and webmasters worth their salt know about and use Google Webmaster Tools. These free tools give webmasters and IT departments insights into what Google sees when it crawls registered sites, shows the scope of how a site is crawled and indexed, offers configuration settings to control how the site is managed, and even provides some helpful feedback on possible site improvements/error corrections. Given that Google owns approximately 66% of the United States market for search query traffic, registering for and using Google Webmaster Tools is a no-brainer. Bing, the search engine from Microsoft, offers its own set of free webmaster tools. For a long time, a lot of folks gave Bing short shrift, and that attitude has extended to its Webmaster Tools. After all, back in the days when it was known as Microsoft Live Search, its marketshare was at best around 10%. However, in 2009, Microsoft rebranded Live Search into Bing, and accordingly invested a ton of resources into improving its index size, its interface (to such an extent that Google has begun emulating original Bing features), and its relevance algorithm. And just as importantly, in 2010, Yahoo!, which had been the #2 search engine by marketshare in the US, abandoned its organic search index and began showing results using the Bing index. As a result, the domestic search marketshare of the Bing/Yahoo! collective is now in the 30% range (depending upon whom you ask) and is incrementally increasing. The ability to gain insight into what 30% of the US search market is seeing when it searches for your website is a compelling enough reason to consider Bing Webmaster Tools to be a vital part of your SEO toolbox. Bing’s tools in concept are similar to Google’s, in that they give you insight into and control of how your site is crawled and indexed. But Bing’s tools and presentation are not copies of Google’s, so let’s talk about what Bing Webmaster Tools has to offer and why you should register your site. Disclaimer: I cut my SEO teeth working for Bing Webmaster Center back in 2008 through 2010. I revised the documentation for the old Live Search Tools and wrote from scratch the documentation for the first release of the new version of the Bing Webmaster Tools. But time goes on, and the Bing tools have evolved substantially since that first release. This is my chance to take a look at what they’ve done since then. And just for the record, I personally use both Google and Bing Webmaster Tools in my work. So should you! A baseline introduction to the new Bing Webmaster Tools was written by yours truly back in 2010 (parts one and two). But as I said, much has changed since then. Let’s take a look at some of the most important functions and their new, exciting features. Overall. Bing Webmaster Tools can be quickly described as charts, charts, and more charts! Everything is laid out in a visual presentation of your site’s data. The charts are typically interactive so that you can select a point on a timeline and get specific data. You can also change and expand the chart’s default timeline view, as the tool maintains no less than six months’ worth of historical data. Silverlight is no longer required. While the initial implementation of the Bing Webmaster Tools required Microsoft Silverlight to access and present chart data, they abandoned that last year in favor of HTML5. This move improved access to all modern browsers, including those in mobile devices, and provided a notable performance boost as well. Site registration options. 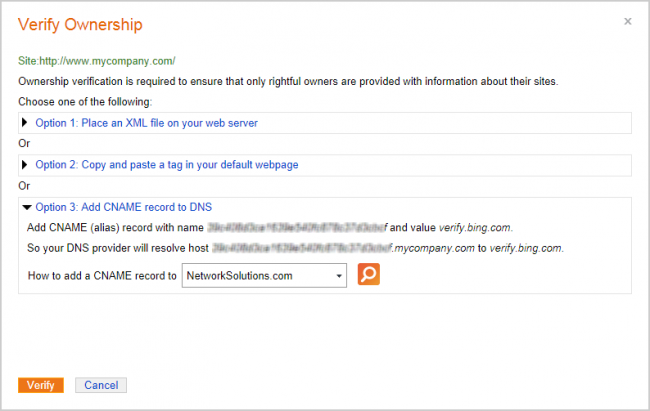 You can now verify ownership of your site as part of the registration to use Bing Webmaster Tools in one of three methods. The newest method, to add a discrete CNAME record to your DNS, is in addition to the previous methods of either uploading a custom XML file or adding a snippet of <meta> tag code to page. All of the data needed for verification is provided by Bing. Find this at Home > Add Site. Add users to the account. 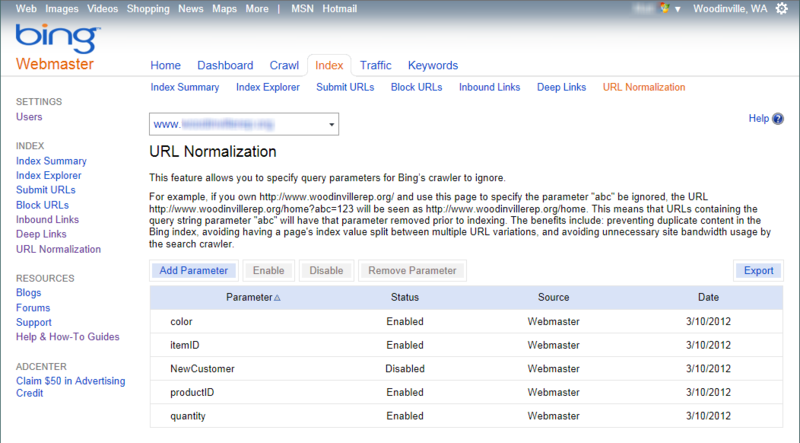 The days of creating new Bing Webmaster Tools accounts, one for each user, for managing one website are over. Bing now allows you to add additional users to the main site account. Better yet, you can add restrictions to each new user, limiting their access if desired to a subdomain or a subfolder of the site root. You can also specify whether the new user is a full administrator for the specified site access, is limited to read/modify rights, or has read-only rights. IT departments will appreciate that. Access this via Home > click a registered site > Users > Add User. Email alerts. 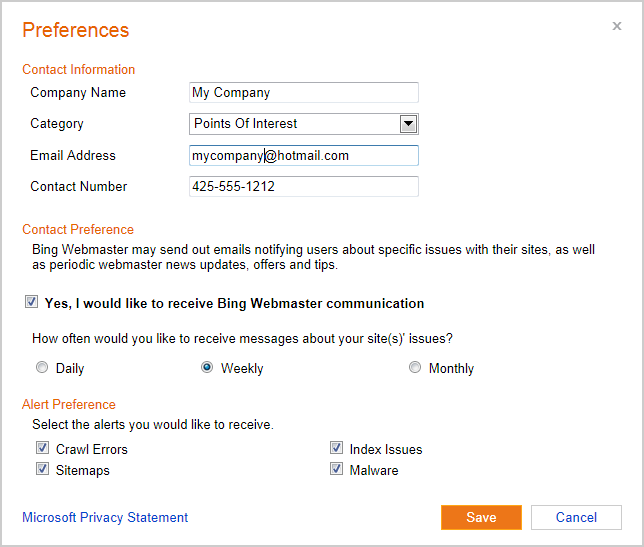 Bing now enables account holders to opt-in to email alerts from Bing Webmaster Center when problems are detected with a registered site. You can sign up for Webmaster email alerts for crawling errors, Sitemap problems, index issues and detected malware. This is configured from Home > Preferences. Technical resources. Bing has added a link to a new library of technical content called Help and How-To guides, covering the documentation of the individual Webmaster Tools, How-To guides, and other pertinent information of interest to SEOs and webmasters. Get to this at Home > Webmaster API. Webmaster Tools API. 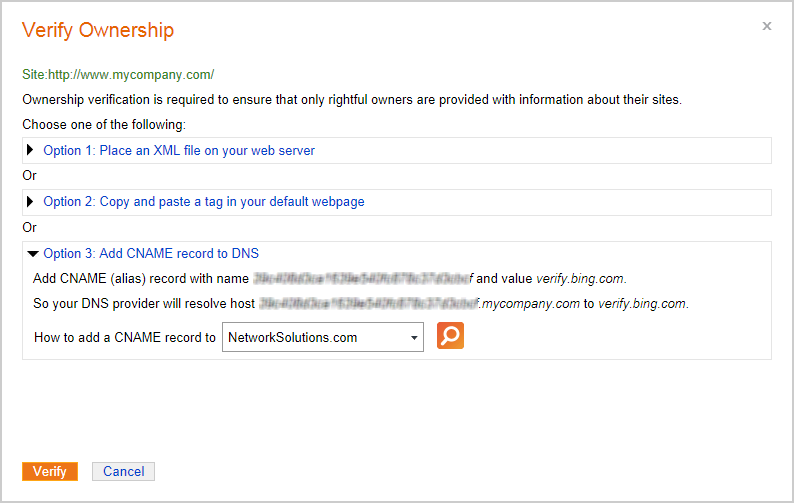 All site data available within your Bing Webmaster Tools account is accessible through the API. Overall. This page remains the Tools home for a site. It’s a snapshot of data covering the last 30 days, showing numeric data (including current trend percentage) for Clicks, Impressions, Pages Indexed, and Pages Crawled. Hover over these figures to get more data. Interactive graphs are also presented covering Traffic Summary (Impressions and Clicks), Index Summary (Pages Indexed) and Crawl Summary (Pages Crawled and Pages with Crawl Errors). Many of the tools offer data export in the form of CSV files. Access this via Home > click a registered site. Overall. Bing offers deep historical data on pages crawled and a separate view showing pages with crawl errors. It also offers access to settings for customizing crawler behavior, data feeds, and markup validation. Access this via Home > click a registered site > Crawl. Settings. You can now chart on a daily, GMT-based time graph when and how deeply Bingbot should crawl your site. 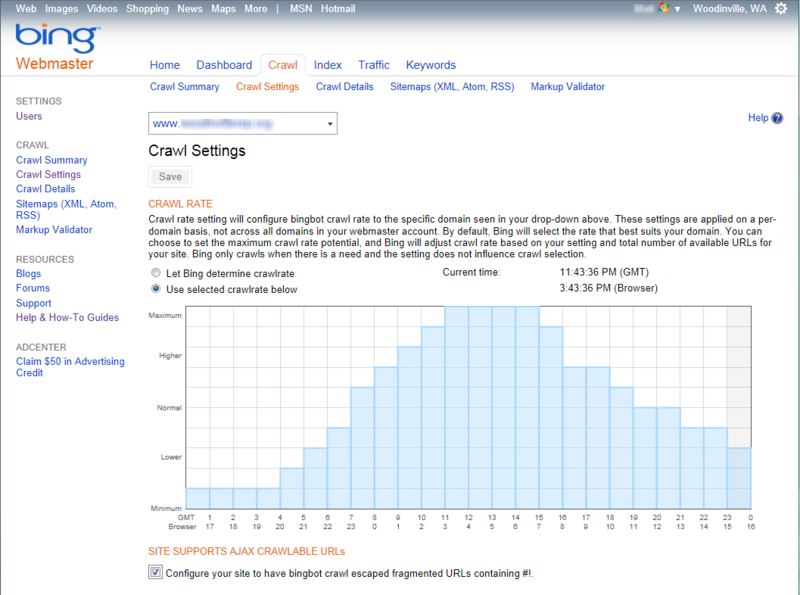 This helps minimize search crawler activity during your site’s busiest business times. Also, owners of sites built in AJAX can set Bingbot to crawl escaped fragmented URLs containing #! . 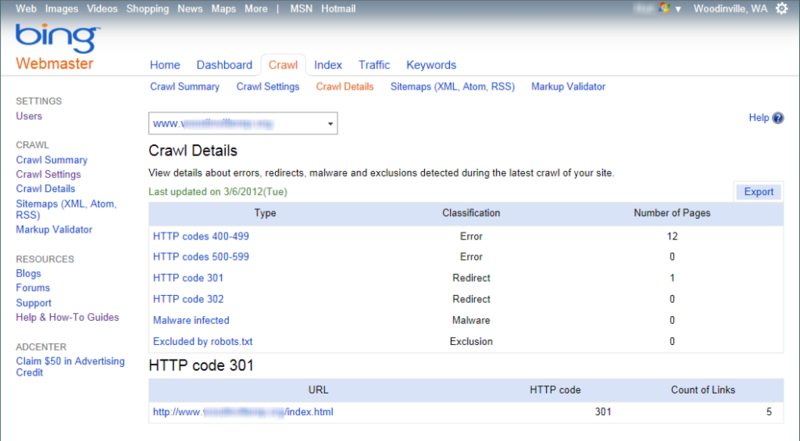 Access this via Home > click a registered site > Crawl > Crawl Settings. Crawler details. This tool now shows all pages returning HTTP status codes 301, 302, 400-level and 500-level errors, as well as detected malware infected pages and pages determined to be significant that are blocked by your site’s robots.txt file. Clicking on the detail line pulls up a list of all URLs affected by the condition. Access this via Home > click a registered site > Crawl > Crawl Details. Data feeds. Bing has expanded the number of supported data feeds to the Bing index to include standard XML-based Sitemaps, Atom 0.3 and Atom 1.0, and RSS 2.0 feeds. Webmasters can submit, remove, and resubmit feeds using this tool. It also shows when the feed was last crawled, if there were any errors with the crawl, and how many URLs were submitted. Access this via Home > click a registered site > Crawl > Sitemaps (XML, Atom, RSS). Access this via Home > click a registered site > Crawl > Markup Validator. Overall. This collection of tools is your glimpse into the Bing index for your site’s URLs. You can see how many pages were indexed over time and see details of that data using Index Explorer. You can directly submit URLs for immediate indexing (up to 10 per day for a maximum of 50 per month). You can also manage indexed URLs by blocking specific URLs or directories from your site. You can see how many sites are linking to yours in aggregate, get details of which sites link to which URLs, and see how this has changed over time. You can even submit dynamic URL parameters to be ignored by Bingbot to mitigate index content duplication (Bing calls this URL Normalization). Access this via Home > click a registered site > Index. Manage the deep links SERP display. When deep links (what Google calls Sitelinks) are present, you can manage which links appear in which order in the Bing search engine results page (SERP) for a given URL. Note that you can’t choose to have deep links implemented if they do not already appear, and you can’t select alternative links to show. You can only manage the deep link URLs Bing has automatically selected for your site by blocking and reordering the existing deep link selections. Access this via Home > click a registered site > Index > Deep Links. Block more URL parameters. Bing has upped the number of URL parameters that you can block to 50. Access this via Home > click a registered site > Index > URL Normalization. Overall. This tool shows you, over a historical timeline, how traffic to your site has changed. You can see an aggregate view broken down by keywords and a separate view broken down by page. Access this via Home > click a registered site > Traffic. Data sources. 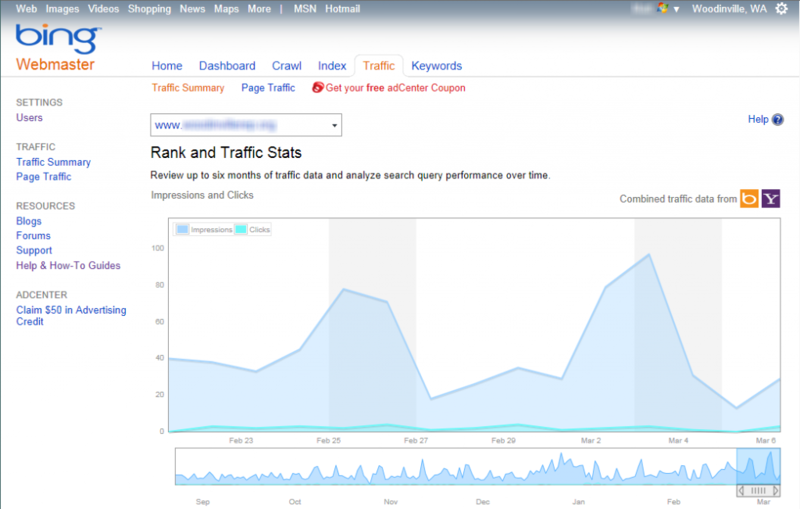 The Traffic data now includes aggregate numbers from Bing and Yahoo! on Impressions, Clicks, and CTR. adCenter integration. The Traffic Summary view now offers Microsoft adCenter traffic data, including Average Cost Per Click and Keywords data to the chart data. You can even find and buy new keywords opportunities in adCenter starting directly in the Traffic data section. New tool. This is a new tool, accessible from Bing Webmaster Tools but apparently not fully integrated within the Webmaster Tools framework (oddly, you lose navigational access to go back into the other Webmaster Tools once you click the Keyword Research tool). Access this via Home > click a registered site > Keywords. 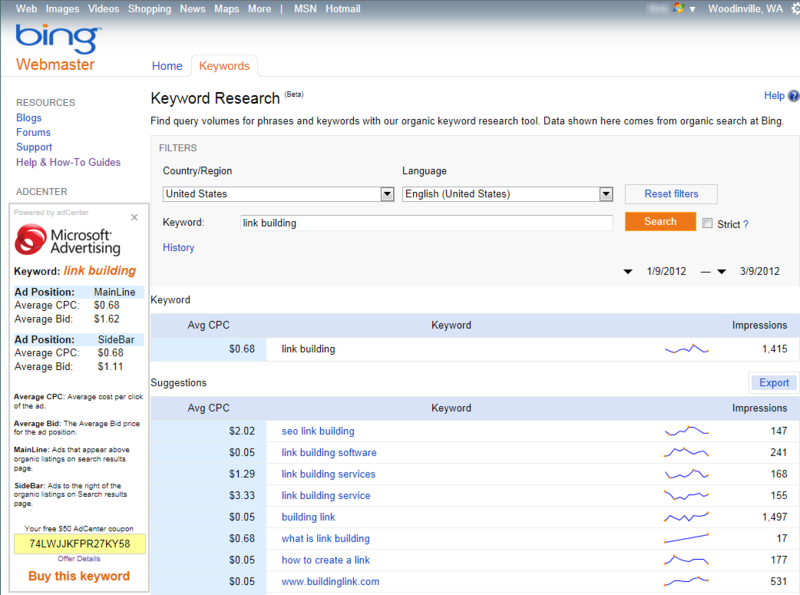 You can also access the Keyword Research tool externally, but you’ll still need to log into your account to use it. 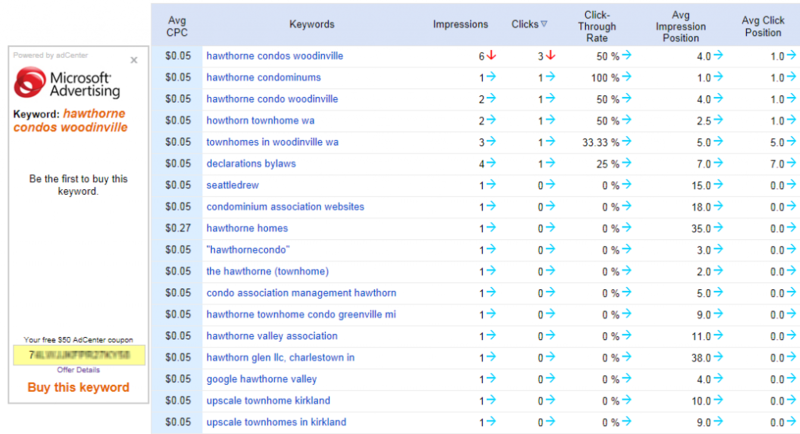 The Keyword Research tool provides raw (no rounding! ), organic Bing query volume data as well as adCenter CPC data and costs on the keyword or phrase you entered, along with related keywords and phrases. The data can be filtered by country, language, and date range. You can also enable a Strict setting to narrow the results to the exact phrase entered. There’s also a History function that remembers your last 25 queries so you can easily go back to quickly compare results. Bing has done a nice job of turning around their Webmaster Tools project from what used to be commonly perceived as low-value tools back in the Live Search days. They have invested resources in this needed space to encourage webmasters and SEOs to devote time and effort to their Bing index standings. Bringing Duane Forrester over from managing the SEO effort for MSN was a masterstroke, as he is a working SEO at heart. His contribution to the improvements cannot be underestimated. 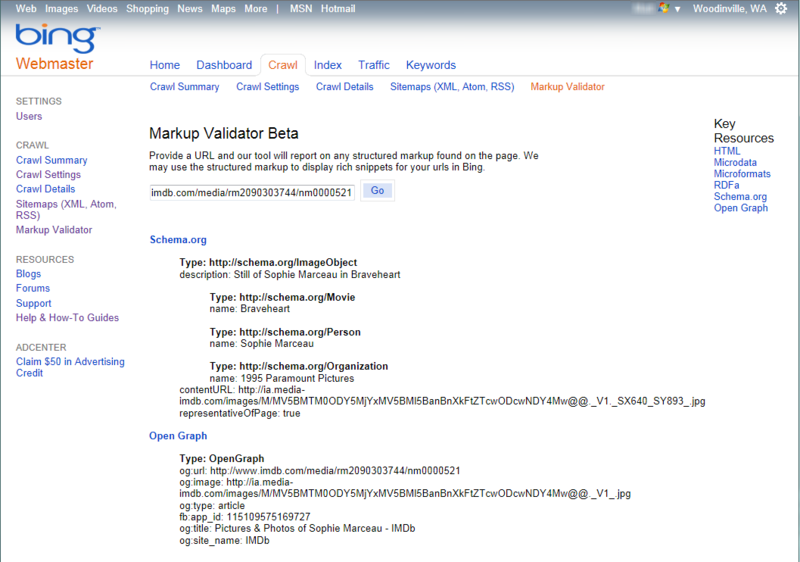 Keep an eye on Bing Webmaster Tools. Duane and his team want to help us succeed, and their continuously-evolving tools are strong steps forward in achieving that goal. I enjoyed this article, it helped explain the keyword and the money listed in the tools. I was confused at first what that was there for. Thanks for the explanation! After I do the site validation successfully, can I remove the xml file in my root directory? Where is “Home > click a registered site > Crawl > Crawl Settings” ?